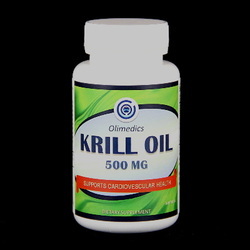 The oil derived from Krill is rich in phospholipids, the building blocks for cell membranes, and Essential Fatty Acids including Omega-3, 6 and 9. Krill Oil is very stable, free of heavy metal content and considered more efficient in the body than regular fish oil capsules. Take 1 soft-gel orally 1 to 2 times daily preferably with meals or as directed by a healthcare professional. CONTAINS SHELLFISH (KRILL).This product is manufactured and packaged in a facility which may also process milk, soy, wheat, egg, peanuts, tree nuts, fish and crustacean shellfish. KEEP OUT OF THE REACH OF CHILDREN. DO NOT USE IF SAFETY SEAL IS DAMAGED OR MISSING. STORE IN A COOL, DRY PLACE.